Pundits on the left cite the economic prosperity and stock performance during the Clinton administration as evidence of the Democratic Party’s “superior” fiscal policies. Commentators on the right retort that the market did well during the Clinton administration despite his policies. They add that if Newt Gingrich’s 1994 Republican Revolution had not forced the President to balance the budget, the economic performance during that period could have been far worse. They then point to the economic record during the Reagan Administration and contrast it with Jimmy Carter’s. Does the market really perform better when a particular party controls the White House? What about the Senate or the House of Representatives? Is it better for the market when a party controls both the legislative and executive branches of government? 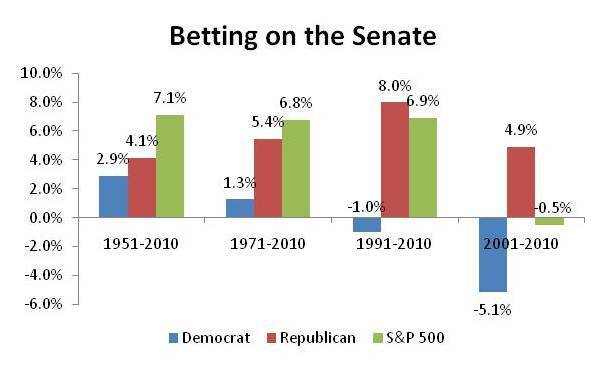 More importantly, could investors have outperformed the market by betting on a particular party? I decided to buckle down and do the math. The answers are both surprising and complex, but a number of trends emerged. When it comes to politicians, I tend to view them as incompetent unless they convince me otherwise. As such, I have always held the notion that a divided government, in which the President’s opposing party controls at least one house of Congress, is better for economic performance than the alternative. I held this view because in a divided government, nothing gets done. How can that be a good thing, you ask? Well, the only thing worse than a lazy and incompetent group of people is a group of industrious and incompetent people. They can do a heck of a lot more damage. However, it turns out that my intuition proved to be wrong, at least over the time periods I observed. The 10-, 20-, 40-, and 60-year average returns all show that the market outperforms during a period in which one party controls both the White House and Congress and underperforms during a period of division. I do not understand why this is the case. I can only speculate. Perhaps one-party control provides investors with more certainty over future fiscal and economic policies, whereas a divided government generates more uncertainty. One way to test this hypothesis would be to measure the S&P 500’s average volatility each year. If volatility were higher during periods of divided government, this observation might support this hypothesis. It looks like the market performance of Bill Clinton’s two terms with the handicap of Jimmy Carter’s one outweighs that of Ronald Reagan’s two terms handicapped by the combined three-terms of Bush junior and senior. Again I can only speculate as to why the market has outperformed under Democratic administrations. Federal policies sometimes takes years to work their way through the system, so it is possible that policies implemented in a Republican administration only began to have an impact during the next Democratic one. Maybe Democratic Presidents have, in fact, been more effective stewards of the American economy. I doubt this is the case based on what I believe to be ineffective liberal economic policies, but it is hard to argue with results. That said, the American economy is so large and complex, and has so many variables that affect it, that it is very different to conclude that its performance is primarily the result of a single President’s actions – whether they are Bill Clinton’s or Ronald Reagan’s. Conversely, the market has outperformed when Republicans controlled the House or Senate and has done so consistently over 10-, 20-, 40-, and 60-year periods I profiled. The market has underperformed during Democratic Congresses. Again, I can only speculate what led to this result. Perhaps Republicans pass more business-friendly bills in Congress. Or maybe they are just lucky enough to control Congress when a Democrat is in the White House. Again, correlation does not imply causation and the American economy has far more variables that affect it then just Congressional legislation. Have Investors Made Money Pursuing These Strategies? The short answer is probably not. The long answer is that investors did best over the past sixty years by ignoring politics. But wait, the average returns for Democratic administrations were higher than the market average. What gives? Part of the answer lies in implementing a strategy based on investing in the market only when a particular party is in power. When that party leaves office, an investor would remove his or her money from the market and receive a 0% return for that year. Of course, one could invest that money in U.S. Treasuries, but I will save this additional complexity for another blog if it happens to change the answer of this analysis. So now that we have an idea of how this strategy works, there are several strategies that a political junkie might purse. He could, for instance, only invest in the market when his favorite political party controlled the Presidency. Alternatively, he could choose to invest only when his party occupied the House or the Senate. Political cynics might pursue a strategy in which they invest in the market only if one or more houses of Congress are controlled by the President’s opposing political party. I ran the numbers for a number of these different strategies and compared the annualized returns an investor might realize on a $10,000 investment over a 60-, 40-, 20-, and 10-year time period. It turns out that in all but a few cases, the best strategy would have been to invest in the market and ignore shifts in political power. Another winning strategy would have been to take $10,000 and put it under a mattress from 2001-2010. At least the $10,000 would have been there at the end of the decade. Investing in the market would have turned that $10,000 into $9,526. Below are the annualized returns for a number of these strategies. Why Didn’t Most of These Strategies Lead to Market Outperformance? By now many may be wondering why the market outperformed during a Democratic administration, but investors could have only earned better annualized returns with this strategy from 1991-2010. The problem is that a Democrat has only been President in 24 of the last 60 years. 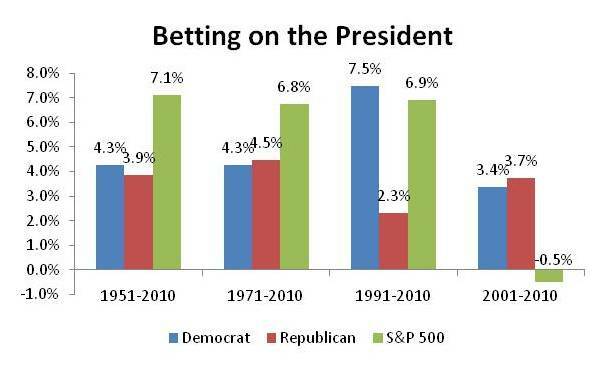 During remaining 36 years when a Republican was President, the market was up in 25 of them with an average return of 16%. These years of positive performance outweighed the years of negative performance and would have netted out to a return greater than 0%, which an investor would earn during the years without a Democrat in the White House. This strategy is the only one that outperformed the market consistently over the last two decades. 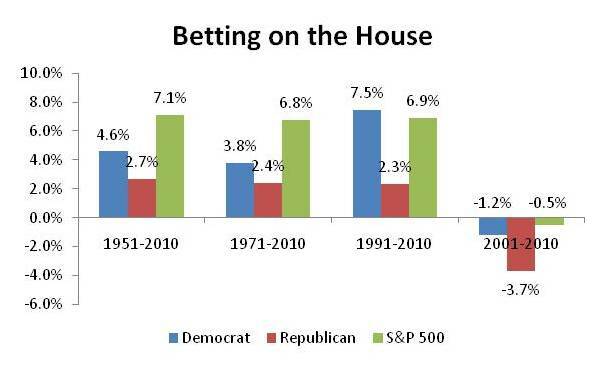 It is also interesting to note that investing during periods when Democrats controlled the House consistently outperformed a strategy investing during periods when Republicans controlled the House. However, this strategy only beat the market during the 20-year period from 1991-2010. Why this is the case, again I can only speculate. Investors are better off following key economic indicators that have more impact on stock fundamentals rather than chasing gusts of whatever foul stench the political winds blow their way. It is important in passing to note that historical returns do not guarantee future performance. The above analysis only reviewed historical trends. It provides little, if any insight into what might happen in the future. This entry was posted in Finance and Economics, Investing, Politics and tagged Democrat, Investing, Politics, Republican. Bookmark the permalink. I believe that one reason markets outperformed during Democratic administrations is that Democrats, in general, tend to pursue policies that attempt to address income inequality and seek greater equality among all wage earners. This is pejoratively called “redistribution of wealth”. Republicans, historically, promote policies that favor greater income inequality, favoring the wealthy minority over the less-wealthy majority, which is euphemistically called “self-determination.” However, a number of recent economic studies have shown that greater income equality actually leads to greater prosperity and economic growth. This, in turn, leads to higher stock market values. Thus, “redistributing” wealth through policies that promote greater equality are beneficial to society, in general, and investors, in particular. I don’t think this prosperity had anything to do with income redistribution. One of Clinton’s greatest triumphs was his championing and co-opting of welfare reform. Some of it was luck. DARPA sowed the seeds of the Internet long before Bill Clinton took office, yet he happened to benefit from the massive shift in the economy following the decline of the defense industry during George H.W. Bush’s administration. I would agree that a widening wealth gap is not a good thing for any society. The question is what to do about it. Part of the reason I think it has accelerated in this country over the past decade is that it is simply cheaper for businesses to hire labor in India and China. Democratic-leaning policies favoring labor unions are a key culprit for why U.S. companies have turned away from higher-wage American workers. Union-dominated fields in this country are poster children for failure. The auto and airline industries are key examples. The education system is another. Greater economic prosperity has everything to do with greater income equality (or conversely, less income inequality) due to the simple fact that the rise in median disposable income fuels consumer spending and business investment. It’s true that rising wages (whether or not because of unions) does create an incentive to ship jobs overseas. However, the rise in corporate profits resulting from lower wage costs has only been enjoyed by a relatively small number of executives and investors, not American workers and the middle class. Further, the reducing income taxes on these executives and the wealthy only further exacerbates the inequality without providing any real benefits to the economy. Trickle down just doesn’t work. To be honest, I haven’t done a thorough examination on whether trickle down economics works, but I do know that the entitlement spending programs introduced during the Great Depression have been a disaster. At some point, taxes do need to increase to reduce the budget deficit, just not now when the economy is still weak. More importantly, the government needs to cut spending. I personally would advocate a reduction 20% funded by a tax increase and 80% funded by cuts in entitlement spending; farm and ethanol subsidies; and pork barrel projects. Once the housing market recovers, I might even consider reducing or killing the mortgage deduction and cutting defense spending. The problem today is that Democrats want to fund 100% of the shortfall by increasing taxes while Republicans want to fund 100% through budget cuts. Rational politicians see it as something in between. First – Thanks for submitting this post to the Carnival of Divided Government. I finally got around to posting it and included your analysis and some commentary that I’ll excerpt here as a courtesy. I know I ‘m a little late to the party, but my blogging has been a bit sporadic to kick off the new year. First, I am impressed with the analysis, but Sthink you got a few things wrong. You are not very specific about your methodology, so I’m not sure how you are coming up with comparable 10, 20, 40, and 60 year averages for divided vs. united government states over presumably the same time periods. More significantly, by utilizing only these undefined long term averages as the basis for hyour comparison, you are missing the most important and possibly only market effect one should expect in divided vs. united government stock market analysis – to whit: short term swings based on investor sentiment. To stae the obvious – the stock market is a discounting mechanism – which is another way of saying that the market is a reflection of what investors believe today about what will happen tomorrow – maybe 3, maybe 6, maybe 12 months down the line. To the extent that a change from a united to divided government – or a Republican to Democrat switch in power – 0r a Democrat to Republican switch in power – or any such partisan variation is at all useful to an investment thesis, the most opportune time to take advantage of it is probably months before the change actually occurs in an election. Any such change is likely to be a short term rather than long term effect (measured in months not years and certainly not in decades) and based on sentiment – not logic. The important point is that the effect will be seen in the stock market long before the change actually takes place. Thanks for commenting on my post on your site and for the link. I think your critique makes sense. I do not think either of our approaches is “wrong.” They just look at different ways of making money on the stock market, namely investing and trading. My analysis focuses on long-term investing rather than short-term trading. It appears you have already done a more comprehensive analysis on the latter in your July post. In terms of my methodology, I calculated the change in the S&P500 from its close on the last day of the previous year to the close of the last day of the current year. All periods of the analysis ended on the last trading day of December in 2010. I also adjusted the S&P500 for dividends. To your point, I think traders could certainly take advantage of sentiment changes in the months running up to elections, but investors, who are looking at much longer time horizons, would be wasting their time and would be better off following key economic indicators. I also would agree that the change in government, rather than the which party is in power, is what generates this short-term volatility on which traders can make money speculating.